Cupcake, my love: Catch up time! Seeing as how it's Labor Day, and I am supposed to be doing N-O-T-H-I-N-G, I figured this would be the best time for me to catch up on my blogging. I hate that I have become so busy that I don't have time to post any of my creations. Hopefully I can start enacting a little time management and get my posts up sooner :) Well enough blabbing already, LET'S GET TO IT!! 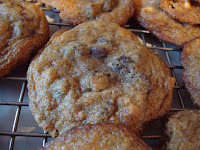 In trying to think of something different for dinner, I kept having a nagging craving for something coconuty. I'm a huge freak for toasted coconut and think that coconut/pineapple are the ultimate flavors of summer. 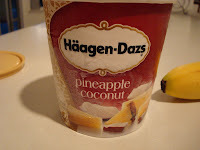 So when walking down the ice cream isle I about passed out when I saw Haagen Dazs' Pineapple Coconut ice cream. It's like it was a sign from God, who was listening to my inner craving and had presented me with this amazing ice cream. 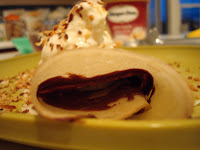 But, knowing me, I wouldn't be satisfied with just ice cream...what could I pair with this...after four more steps down the ice cream isle, there they were...packaged crepes! I could totally do something with this. My mind now racing, I scurried through the other isles grabbing my remaining ingredients. 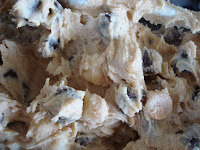 Once we were finished eating dinner I quickly asked if everyone was ready for dessert, because I had been waiting for this dessert ever since I had gotten home. "Yeah, we're ready"...sweet! I jumped up and quickly started my skillet to toast my coconut in. Pulled out the ice cream to let it soften a little and began building my masterpiece. 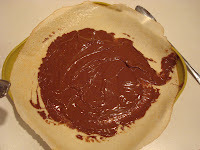 The first step is to take the crepe out of the bag and place it on your plate. 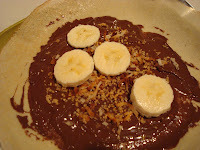 Next, spread the crepe with a thick layer of slightly melted Nutella :) Top the crepe with some of the toasted coconut and sliced bananas. 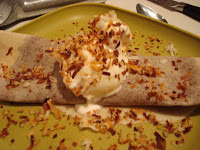 Roll up the crepe and scoop out a nice big chuck of ice cream, topping with even more toasted coconut. Take a seat and get ready to pretend like your in Jamaica Mon!! 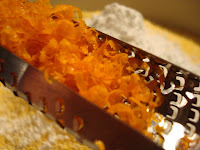 As I was poking around in the wonderful world of blogging I visited one of my favorite blogs...Vanilla Garlic. 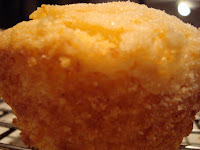 Garret, the creator, comes up with some of the most unique and amazing recipes and when I started reading about this Orange White Wine Cupcake I knew I had to try it. Especially when Garret claimed that the entire prep time was only about 5 minutes! Totally excited about the awkward ingredients I set out to give these cupcakes a try. The only thing I did differently than Garret's recipe was to use Riesling instead of White Wine, I'm all about the sweet wines, so that's what I went with. 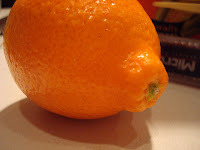 I also had a tangelo which I zested, instead of an orange. 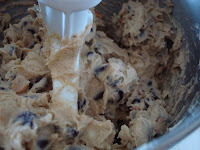 Once I began putting this recipe together I was amazed at how easy it was, I was also amazed at how good the batter tasted! 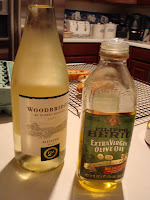 When I saw that the recipe had Olive Oil, I must admit I was a little skeptical. As I dropped the batter into the muffin tins, I made sure to give each cupcake a generous sprinkling of sugar...and into the oven these went. My cupcakes didn't use the whole bake time that Garret suggest, but my cupcake pans are also very dark, so just make sure to keep an eye out for that. As soon as I pulled my cupcakes out of the oven I was excited to try them, so I eager ran my butter knife around one of the cupcakes to loosen in up and tried to take it out of the pan. The entire cupcake broke apart into chunks!! I almost started crying because I thought the rest of the cupcakes would do the same thing and that I had some how ruined them. 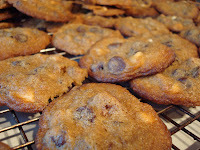 But I came to find out that I just needed to let them cool off longer and set up in the pans. So after waiting patiently for a few minutes I was able to, easily, get all of my cupcakes out, safe and sound. And let me tell you, one bit of these cupcakes and you will swear you died and went to Heaven! I don't know where Garret came up with this amazing combination, but thank God he did, because this was one of the lightest, sweetest, most refreshing cupcakes I have ever had. 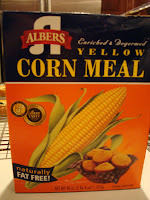 The flavor combination was incredible, the cornmeal wasn't too over powering, it just added a nice crumbly texture to the muffin and the tangelo zest helped to brighten up the sweetness of the wine. 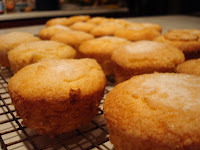 And that crispy, crunchy, sugar topping made these cupcakes perfection! I took these bad boys to work and they were a huge success, I actually had people arguing about who was going to be able to take home the leftover cupcakes! 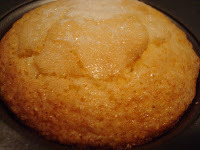 (Which wasn't necessary anyways, because there weren't any left over :0) ) So thank you Garret for giving me a unique, but oh so amazing new recipe to try, this cupcake will definitely become one of my staple recipes!!! 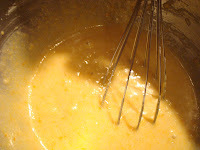 2) In a large bowl, whisk together the oil, eggs, sugar, and wine until smooth. 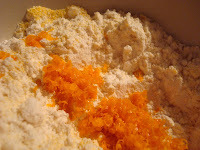 Add the other dry ingredients and the zest; whisk together gently. 3) Line cupcake tin with cupcake papers and spoon into the papers about 4/5 full. 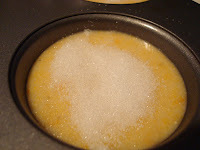 Sprinkle on the sugar (topping will be thick). 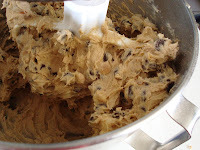 Bake for 22-25 minutes, or until a cake tester comes out. clean.